Welcome to Squalor, our new column devoted to helping you be less of a disgusting slob. Cleaning expert Jolie Kerr is here to save you from yourself, ready and waiting to answer your filthiest questions. Need help? Email her. I recently got a brand new cream twill couch. My brother-in-law's girlfriend got makeup on it this morning and they can't seem to get it out. They used Scotchguard and some Wine Away remover, but it doesn't seem to be working. I called the manufacturer — they said to take the slipcover off and wash it in the washing machine, but that I need to wash all of them so there is not a difference in color. I'm trying to avoid washing all the covers if I don't absolutely have to. Do you have any suggestions for spot cleaning it? I'm going to go ahead and presume that your BIL's lady friend is Adrienne Maloof because life is more interesting when I imagine that people who wear hair tinsel and leave full body makeup stains on sofas are a part of it. Before we get into how to spot treat those slipcovers — which is super easy, so don't you fret! — let's first address the valiant but misguided triage effort on the part of BIL and GF of BIL. (Getting into the science behind the cleaning is one of my favorite parts of this job.) Generally, when people refer to Scotchguard what they're talking about is a fabric protector, which means it's to be used before an accident happens. So if that's what your guests were using to try to clean the stain it was destined to fail them. The lovely folks at 3M, it should be noted, do offer a foaming Fabric & Upholstery Cleaner which is a fantastic thing to have in the home if you have upholstered furniture. The reason the Wine Away didn't work was because that's a product designed to treat tannin stains — coffee, tea, fruit juices including that of the fermented grape variety, those are all things that fall into the dastardly tannin category — while makeup is generally a stain of the greasier variety and needs to be treated as such. Water: This might sound too good to be true, but just plain old running water oftentimes is all a stain needs to flee from your belongings under the cloak of darkness. 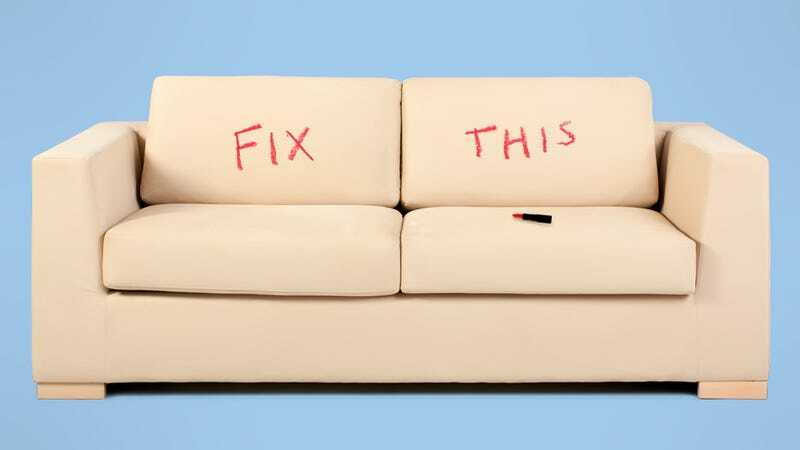 In the case of your slipcover, take it off the couch and hold it under running cold water in the kitchen sink or bathtub. That will help to flush out a lot of the makeup. It might even get out all of it, particularly if the stain is still fresh (though that's not the case here). One helpful thing to know about using the flushing method of stain removal is that it works even better when you flush from the backside, or unstained, part of the item to the front. That way the water can push the stain away from the fabric, rather than back through it. Soap: Once you've flushed out as much of the stain as you think you can using only water, grab a clean rag or sponge or washcloth, wet it and put a small amount of laundry detergent or dish soap on it. Then wring it so it's sudsy but not soaking and tamp at the stain with that. You don't want to rub hard, as that can grind the stain in further. Then keep flushing with the cold water and going over it with the rag and soap. Again, just be careful not to grind at the stain — that can also cause the fabric to wear, which you don't want. Let the force of the water do most of the work for you. Foaming Upholstery Cleaner: If the stain is set in to the point that soap and water won't entirely eliminate it, a foaming upholstery cleaner like Resolve or the aforementioned Scotchguard product is the ticket to saving you from having to launder allllllllllll the slip covers. There are also spray upholstery cleaners, but for my money I think that the foam ones work better. Since usage instructions can vary greatly from brand to brand, check out the manufacturer's directions on the packaging and then go on and follow those. This is also the route you'll want to go if you're trying to clean upholstery that isn't removable and therefore can't be held under your faucet. Unless, I suppose, you're Magnús Ver Magnússon and can just tote full-sized couches around your home on demand. I mean, maybe you are Magnús Ver Magnússon? Actually? I will just go ahead and presume that too! I was at a yard sale and I saw this absolutely beautiful vintage full-length crinoline/bustle/underskirt tulle-y foofy thing. I don't know what the netting is made out of but the bulk of the garment is satin. Here is my problem: the previous owner was clearly a smoker of many things, all of which this skirt now smells like. Oh, the loveliness! Oh, the smell of pot smoke! It was so inexpensive, I couldn't say no to it, but now I am flummoxed as to how to clean it. What can I do? Oh! I am so glad you bought that gorgeous-sounding thing, because we can totally get that smell right out. I'm even going to provide two methods, so that you might employ personal choice, because I am a giver. And also because I can't have you swishing around, smelling like a one-woman Phish show. The first approach to de-stinking the crinoline is to hand wash it using a combination of white vinegar followed by laundry detergent. I see that face you're making! "Satin? In water? [CLUTCHES PEARLS]" But it's perfectly safe, not to worry. To begin, fill your kitchen sink about halfway up with cold water. Well wait — take the dirty dishes and such out of it before you do so. And quickly wipe it down with a sponge or paper towel so that you're sure there won't be any, like, Toaster Strudel crumbs floating around in the wash water into which you're going to put that bustle. I mean, you know to do that probably. But I like to be thorough in my instructions. Once you've got some wash water in there, add a ¼ to a ½ cup of white vinegar. Then put the garment in the solution, and swirl everything about so that the crinoline is fully submerged; the swirling will also create an agitation effect which will help to release any built-up dirt. Once that's done, let it soak in there for 15-30 minutes, after which time you'll go back, drain the sink. Oh, right, the water will probably be murky and gray and you might feel slightly ill looking at it. That's good! Better that stuff go down the drain than continue to live on your pettiskirt. Refill the sink with more cold water, this time adding a very small amount — like a ¼ teaspoon-type very small amount — of liquid laundry detergent. If you've only got powdered detergent that's okay, you'll just want to dissolve it first in a bit of hot water and then add the sudsy slurry you've made to the cold water. Now go back into your wash basin and give the item another good swirling, followed by another short soak. Then drain the sink one last time and gently press down on the crinoline to remove as much water as you can. Don't (don't don't don't!) wring the item, which can cause damage to the delicate fabric. Just press down, that'll do you right well. The last step here is to roll the crinoline in a clean towel, then reshape and lay it flat to dry. Ta da! While that is the route I would suggest you go, because it will also help to brighten up the bustle by removing any dirt or grime built-up on the garment over the years, if you don't want to muck about with hand washing or just really, really, really hate the smell of white vinegar (it happens) you can, instead, use an activated charcoal (also called 'active charcoal' or 'active carbon' or 'activated carbon') odor eliminating product. You can buy activated charcoal in a whole bunch of different forms (including, I kid you not, activated charcoal underpants) but I would suggest trying out one of the Innofresh products for two reasons: (1) they're small and come in bar form, which makes them easy to use with clothes and (2) they offer my readers a 10% discount and that's such a nice thing of them to do, don't you think? Use the code "JolieCleanperson" at checkout to get that deal. To use activated charcoal you'll need a sealable plastic bin or a garbage bag. Place the stinking item in question and odor absorber in the bin or bag, seal it up and let it laze around your house for a day or so. Then open it up, give the crinoline a sniff and see how things smell. If there's still a lingering odor, seal it back up and give it another day or two of relaxation.